Type in your valuable words, tell us who you are and hit 'Send a wish'. 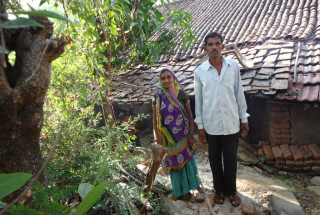 Anjalidevi and her husband have been working as agricultural labourers for the past 15 years. Anjalidevi has three daughters; eldest daughter Akilandeswari is 13 years old and younger ones Vinotha and Durga are 12 years and 9 years old respectively. 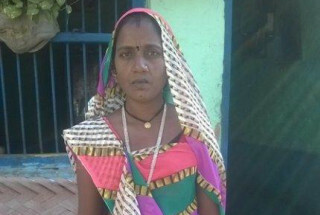 The daily wages of Anjalidevi and her husband get spent on food and other basic amenities leaving no money to save. The family lives in a semi kaccha house with no toilet. Without access to a toilet, her family is forced to walk three kilometers just to relieve themselves in the false privacy of dense bushes or isolated fields. The family members, especially her daughters are subsequently at risk of infection, molestation, and even insect or animal bites. Your contribution will provide this family access to improved hygiene and better way of life. Send a good wish to these rural women and we will contribute Rs.10 for each wish! Write out your good wish here! Hailing from Kolakudipatti village in Trichy, 40 year old Jayanthi is a cheerful lady who believes in living in the present. She is a farmer who toils day and night to get a meagre income. She lost her husband 8 years ago and has been living with her mother Chinnaponnu since then. 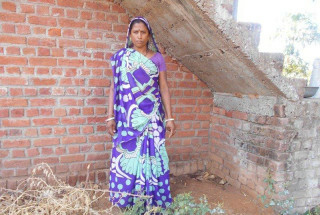 Strong independent woman, Jayanthi struggles to make ends meet and has been constantly falling ill. Jayanthi needs funds to build a toilet for her family that will help them to defecate in a comfortable, private and a safe place. 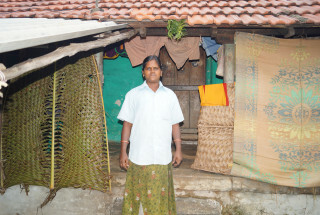 Your contribution will help Jayanthi and her family lead a dignified life. 30 year old Thavasu lost both her father and mother to a menacing disease 2 years back and has been standing on her own feet since then. She belongs to Kolakkudipatti village in Thottiyam block of Tiruchirapalli District and earns a very meagre income as a daily wage labourer. She has no toilet at home or a public toilet in the immediate vicinity. Without access to a toilet, she is forced to walk a kilometer just to relieve herself in the false privacy of dense bushes or isolated fields. This makes Thavasu prone to many communicable diseases, molestation and even animal and insect bites. 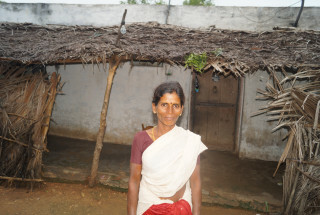 Your contribution will help Thavasu enjoy benefits of basic sanitation at the comfort of her home. 34 year old Dhanalakshmi spends most of her time in tending to her family in Kolakkudipatti village in Tiruchirapalli District. She is very good at handicraft work but was forced to take a break from work to take care of her 8 year old kid Arun. Dhanalakshmi’s husband is a daily wage farmer and most of the family’s income is spent on the kid’s education and other basic amenities. A toilet at home will be very useful as Dhanalakshmi no longer has to walk in the dark carrying her son with a torch to answer nature’s call in the night time. 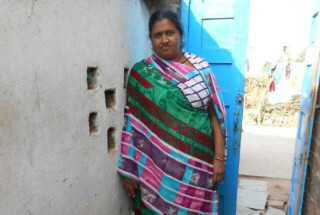 Your contribution will help build a toilet in Dhanlakshmi’s home to ensure safe and closed defecation for her family. 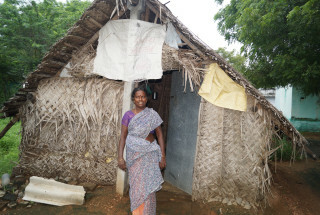 33 year old Chandra lives with her family in Kolakudipatti village in Thottiyam block of Tiruchirapalli District. 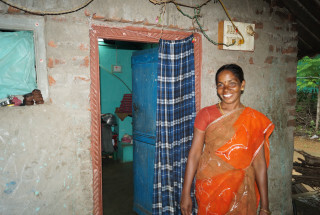 Chandra and her husband Jayabal have been working as agricultural workers for the past 10 years. Chandra has five members in her family; she, her husband, her son Dhilip and her two daughters Kavya and Kalpana. The family does not have a toilet at home and travel one kilometer to relieve themselves in open fields. This is time consuming and Chandra is in constant fear of her kids being bitten by insects and animals. Your contribution will help this family practice safe, comfortable and private sanitation to lead a dignified social life. Nathiya is a 23 year old woman who works as daily wage labourer in the agricultural sector. She is blessed with one daughter Bavitha and a son Kishore. Nathiya and her husband spend most of their income for medical requirements for their kids due to constant ill-health. The family does not have a toilet at their home and walk few kilmoetres every day to defecate. This consumes a lot of time and also puts the kids in risk. 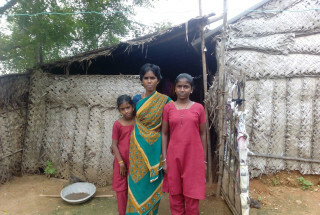 Your contribution will help this family begin their day with trouble-free sanitation practice. 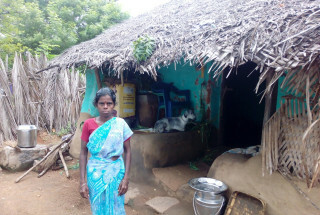 Thangammal and her family live in Kolakudipatti village in Thottiyam block of Tiruchirapalli district. Mother of four children, Thangammal’s eldest daughter is married and lives with her husband in the same village. Her second daughter is in college and the younger ones are in school. 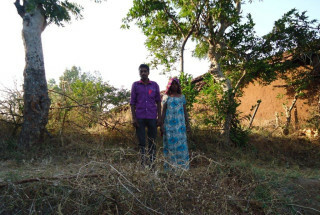 Thangammal and her husband toil day and night as agricultural workers to feed their children and send them to school. As the kids have grown up, they are finding it difficult to defecate in open fields. 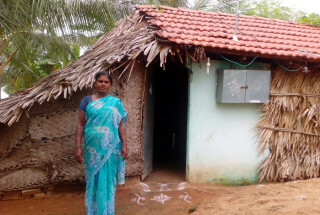 As Thangammal and her husband cannot afford to spend on building a toilet your contribution will help the family with the same. 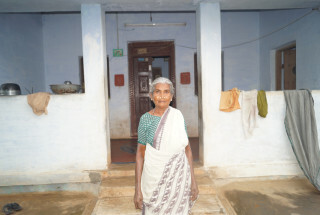 Uma and her husband moved to Kolakudipatti village in Tiruchirpalli District when they got married 10 years ago. The couple have three children; Dhinesh Kumar studying 11th standard, Deepa studying 9th standard and Thilagavathi studying 7th standard. With three kids to tend to, the couple spend most of their income in getting nutritious food and school supplies for their kids. They live in a kaccha house with no toilet provision. Since it is extremely time consuming and unsafe for her kids to defecate in open fields, Uma hopes to build a toilet for her family. 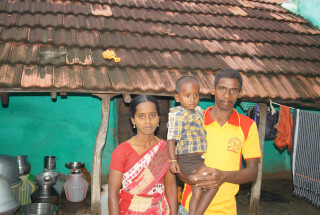 Your contribution will help Uma's family enjoy benefits of basic sanitation and improved health. Sangitaben is a 40 year old seamstress residing in Rabdal village with her husband and five children. She had no other option but to take up sewing as her profession to cover the household expenses of her family. Fortunately she learnt the art from her mother and started her micro business by purchasing one sewing machine. Over time she has seen a steady rise in consumer demand and now earns Rs. 2000 per month. Her husband works as an agricultural labourer and earns Rs. 4000 per month. The family neither has a toilet in their home nor in the immediate vicinity. 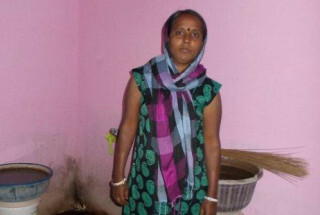 Your contribution will help Sangitaben’s family enjoy the basic benefits of sanitation. 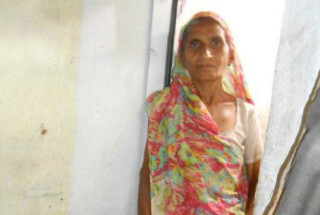 Lalitaben lives in Dahod slum with her husband, and are daily wage labourers, earning Rs. 6000/- per month. The live in the village of Delsar, in Dahod slum, in Gujarat. Lalitaben and her husband's meagre income is barely enough to provide for their family of seven. Despite their humble background, Lalitaben dreams of educating every single one of her children. She dreams of sending her children to bustling cities, cities which she is familiar with only through pictures. The large family does not have a toilet in their cramped house, and each one of them is forced to defecate in the open. And this places every single one of them at a risk of infection from various sources. With your contribution, Lalitaben and her family will be able to build a much-needed toilet in their own home, and be able to access safe and hygienic sanitation. Shumitraben lives in Harijan Vas, in Dahod district, Gujarat. She and her husband are employed as bamboo workers, and earn around Rs. 8000/- per month. The couple have two children. None of them have known the luxury of owning a toilet within their home – they have to go outdoors every time they need to relieve themselves. Shumitraben wishes she could provide a safer environment for her two young children – she does not want them to grow up in a world where they feel embarrassed to relieve themselves. She wants them to be able to access a basic human right – the right to sanitation. Your contribution can help Shumitraben build a toilet within the comforts of her home, and provide a dignified life for her children – and for herself. Aaisaben is a resident of Khatakivas district in Surendranagar, Gujarat. She lives with her husband and four children, in a tiny house. 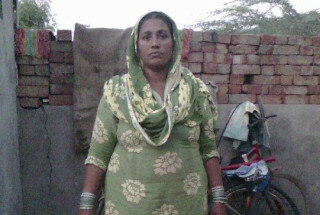 Aaisaben and her husband are labourers, and earn around Rs. 7000/- per month. Aaisaben, her husband, and her children can barely manage within the space they call home – there is not enough place for all of them. To add to their woes, they do not have a toilet within their home. Multiple times every day, they are forced to step out of their home, in order to relieve themselves. Aaisaben often faces jeers and molestation when she is forced to use the open fields for relieving herself. But she can barely do anything to stop it. 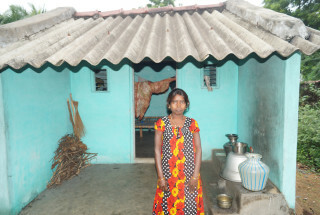 Aaisaben and her family desperately need a toilet in their home. In order to help them lead a dignified life, you can contribute towards building a toilet in their home. Rehmatben lives in Khatakivas district in Surendranagar, Gujarat. The centre of Rehmatben's world is her family – her husband, and their two young children. She and her husband are daily wage labourers, and earn a measly sum of Rs. 6500/- per month. Rehmatben dotes on her two children , both of whom are bright, and wise beyond their years. However, she despairs of bringing her children up in her current location – a place where they have to use the open space near to their home for defecation. In a place where crime is rampant, Rehmatben fears the miscreants, who wouldn't even spare children. Rehmatben's dream is to provide everything she can for her family – and this starts with safe sanitation through a toilet in their home. By making a contribution, you can ensure Rehmatben's dreams sees the light of the day – and ensures a safer, more dignified future for her family. Kherunben lives with her husband and their two children in Khatakivas district in Surendranagar, Gujarat. She and her husband work hard as daily wage labourers. Their measly income of Rs 6500/- is barely enough to make ends meet. 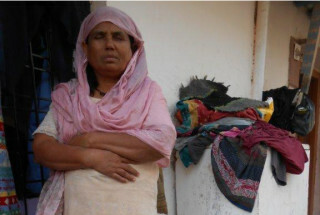 Kherunben has a dream – a dream of owning a large home, with enough space for her two children to run around. She also dreams of a time where she can own a toilet in her home, so her children don't have to fear every time they need to relieve themselves. A simple dream, which you can contribute towards. Your support will help Kherunben build a toilet in her home, and help her and her family take a step towards better sanitation and hygiene. Nitaben resides in Ratanpur in Surendranagar, Gujarat. She and her husband work as cobblers, earning around Rs. 6500/- as a monthly income. Their meagre income is barely enough to keep their family of six afloat. To make matters worse, Nitaben and her family have often fallen ill and there's hardly anything they can do about it. The reason? They are forced to use open spaces to defecate, and are often targets of insect and animal bites, which results in several illnesses. With no doctor or healthcare centres in their village, Nitaben and her family are left to fend for themselves. A toilet in their home would solve most of their problems. Your contribution towards building a toilet in her home will help Nitaben and her family lead a more dignified, and safer, life. Roshanben is a resident of Firdosh, in Surendranagar, Gujarat. She is a single mother, who struggles on a daily basis to bring up her four young children. Despite her struggles, she has high hopes for her children. Her daily sacrifices seem worth it when she sees the smiles on their faces. Her monthly income of Rs. 7000/-, which she earns as a labourer, is spent on taking care of her children's needs. As hard as she works, there is one need of her children she isn't able to take care of – a safe environment. She and her children use the fields next to their home every day as a toilet, as they do not have the luxury of owning a toilet at home. Roshanben only wishes for a safer, cleaner environment to bring up her children in. You can help this dream become a reality for Roshanben. 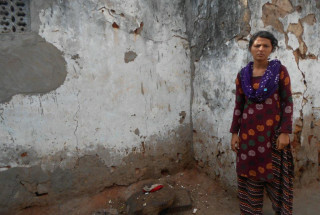 Contribute now and help build a toilet in Roshanben's home. The underprivileged women of India are often an inspiration to those of us who have it easy. Good wishes to Anjali Devi and her family for education and progress. To achieve big, believe in yourself and be mentally strong. MATA,PATNI AUR BEHEN WE ALWAYS CHERISH THE HARD WORK PUT IN BY YOU WITHOUT ANY MURMUR.ACTUALLY IT IS WORTH EMALUATING BY MEN! Most Indian’s still do not have access to modern sanitation. only 32% of rural households have their own toilets and that less than half of Indian households have a toilet at home. There is an urgent need for more such campaigns all across India. It's a great initiative! Good luck for accomplishing this mission. Women are the backbone of our society, and yet 300 million Indian women have no access to basic hygiene and sanitation (United Nations 2014). We want to begin a wave of change and you can join us. In India, a majority of women and girls residing in rural communities lack a public or home toilet, and remain uninformed of hygienic and menstrual health practices. Our daily hygiene products are designed to contribute 5% of net revenue to improve women’s hygiene and sanitation. With one bottle of hand sanitizer, we provide consumers with a high-quality product and influence the realities of rural women and girls through supporting hygiene and sanitation initiatives. Be. The Solution is a new online brand of daily hygiene products. 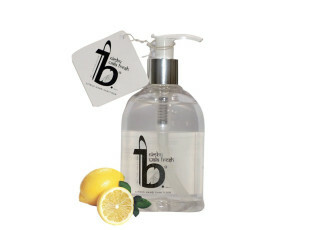 We bring you a refreshing take to your ordinary personal care routine. Be.’s formula uses naturally-based ingredients. Be. has curated hand sanitizers, body mist, hand soap, toilet seat sanitizer, and an intimate wash for women with the everyday Indian woman in mind. We know caring for your skin with the healthiest products is important to you. For this reason, Be. sources high-quality ingredients from lavender, lemongrass, orange, lemon, black pepper, aloe vera, and green tea. Our brand helps women empower one another and strive toward a better future for India. As a new brand, our hygiene products are designed to make a woman’s personal care and hygienic lifestyle easier to manage on a daily basis, and give back to society. Be. The Solution is unique to India and originates from Indian thought. Be.’s philosophy is simple. We believe every Indian woman deserves to feel healthy and beautiful in her own skin. While using personal skincare products that nourish your skin with natural and healthy ingredients, you will provide sustainable solutions to improve women and girls hygienic sanitation. When you are shopping online, Be. makes it easy for you to get involved with this cause. Copyright © 2015 milaap.org. All rights reserved.